You can create an account by clicking on the "Log In" link found at the top-right of the website and fill in the New User section. All we need is your name, email address, and a password. Please ensure that your password must be alphanumeric and includes at least ONE upper and lower case letters and a number. 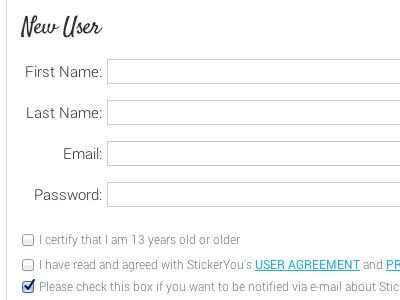 Your account is now registered, and you can begin to order stickers from StickerYou!